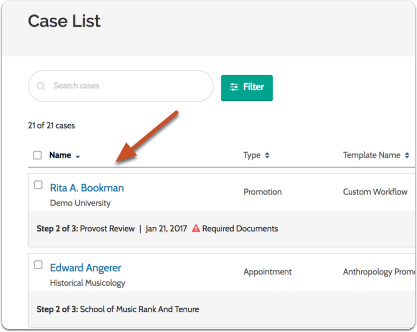 Administrators can close cases in Interfolio Review, Promotion & Tenure from either the case list or the individual case page of a candidate. 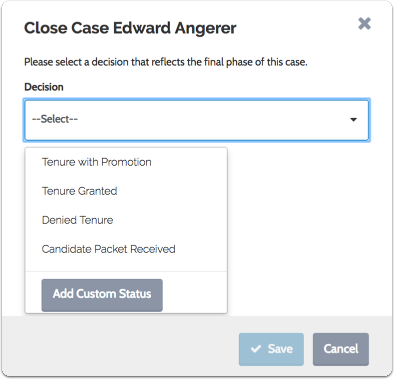 When a case reaches the final step, a "Close Case" button will appear on the Case page. After closing the case you will be asked to apply a final status or "decision" to the case. You can also close cases from the "More options" menu at the top right of the Case page. 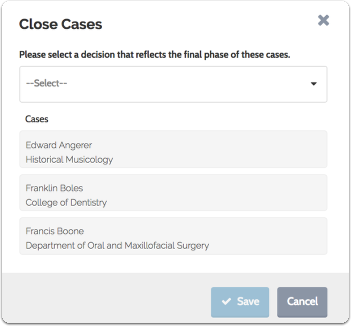 From the case list, Administrators can close more than one case at a time if the cases share the same final status, or you want to assign them the same final status. The article below provides instructions for closing cases in Interfolio RPT. 2. 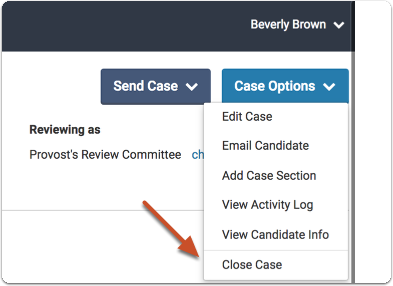 Click the "Case Options" menu to the right of the page and select "Close Case"
When cases are closed they will no longer appear in the list of active cases. Only Institutional Administrators can delete a case, and only once the case has been closed.